Bicomart Magento 2 Multi Vendor Marketplace Theme is created by M2themes. 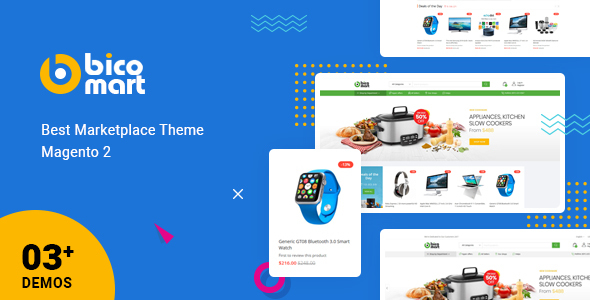 This special Magento 2 Marketplace Theme allows vendors to sell their products effectively for Marketplace Website to sell digitals, electronics, supermarket, fashion, Home Decor, Houseware etc in order to make your market more powerful like Amazon, Ebay, Flipkart, etc. To better support for your market, this Bicomart is created with 03+ Different Home Page & somes diverse CMS Pages, Categoriess, product style. It is one of the new best Magento 2 Market Template, a great integration of bundle Magento 2 Modules such as Magento 2 Mega Menu, Auto Search & Product List and well-code on Magento 2 framework to ensure smoothly speed & increase convert sale sharply. Interestingly, with fully 100% Magento 2 Framework, this Magento 2 Theme lets store owners can create their marketplace quickly & cost-effectively. Unlimited Customization allows to modify or add any functions your market as you want with no conflict. Plus, Bicomart is Optimized SEO for content & Images support, which helps your marketplace get better rank results on Search Engine. And What are you looking for Bicomart – Awesome Magento 2 Theme for Marketplace Store? With Bicomart Magento 2 Theme for Marketplace, it is very ease to use, build & launch market website. 03+ Premade Market Demos, Flexible Layout & better customers experience on Shop are the best choice for Marketplace store. 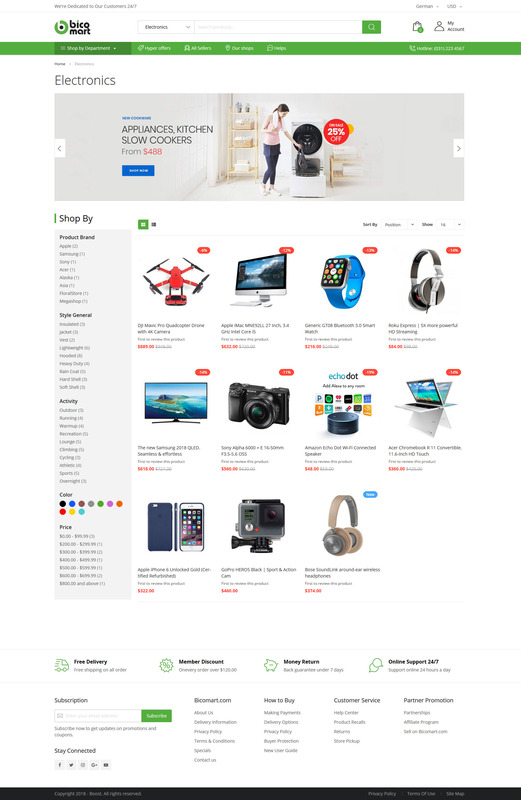 Bicomart Magento 2 Theme for Marketplace is super well-suited and perfect display on any kind of screen of Laptop, Macbook, Desktop, Tablets, and so on. Beyond responsive layout, it comes with the superb mobile experiences. Choose your demo from 3 Available Homepages for your Online store. Building page quickly for Professional Online Store. All homepage demos are well-designed and incredible. Firstly, Bicomart – Powerful Magento 2 Theme for Marketplace is fully compatible with powerful Magento 2 Marketplace Extension, specially Magento 2 Multi-vendor Extension from Landofcoder – one of the best Magento 2 Extension for Marketplace, Multi Vendor. Only touching Product Slider can you view all products and choose exactly product you want . Undoubtedly, with Simply step, your image product can be moved very fast for in your store. We all know that fast speed loading page is extremely important. It can push conversion rate to higher user experience. So does Bicomart – Powerful Magento 2 Theme for Marketplace. To attract more customers’ attention and raise conversion, let’s create hot deal for sales, promotions or upcoming events. Hence, Bicomart will make your market website always newly eventful! 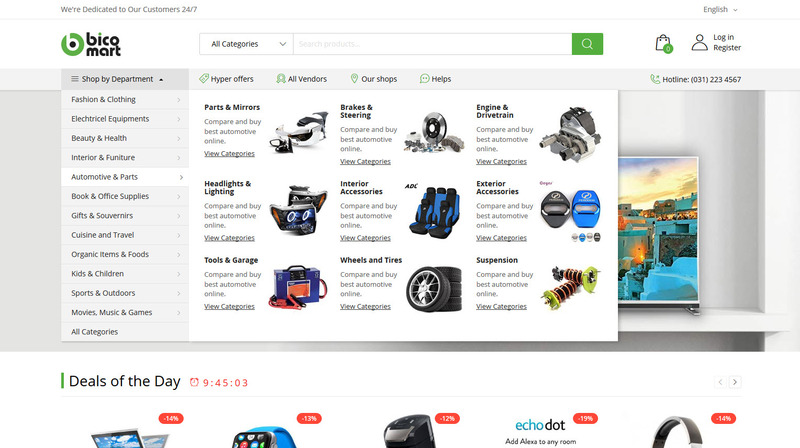 Our Magento 2 Marketplace Theme – Bicomart is SEO-friendly as all other ones. You can make your products and brand more well-known by more customer on search engines. They can get access & purchase easily on mobile. Bicomart is specially designed with High Conversion Rate in mind; thus, customers can start selling online fast and effectively. Store owner can raise the loyalty of the customers to the website. Make sure to create Your powerful Website with full controls such as Orders, Email, Shippings, etc. Just go to the backend and take full control over what you want to update or configure for your website with easy steps. Make your website more well-known with useful buttons of powerful social networks. They can be named as Facebook, Twitter, Youtube, Linkedin, RSS, Vimeo, Pinterest. Ves Bicomart – amazing Magento 2 Multi Vendor Marketplace Themes includes a lot of advanced Magento 2 Extensions to ensure a flawlessly display, better interface & customers experience on this. They are Ves Setup, Mega Menu, Auto Search, Theme Settings, Ves products List. Bicomart is created based on Magento 2 which contains multi choices for customization. Therefore, You can build your site same to demo or customize it for yourself. No limited for customization. Also, It is powerful theme setting which can help you to customize easily.